Donations from the Indiegogo campaign have been flying out the door. So far Dot Girl kits have been donated to Sun Valley Indian School, The Lincoln Community School, First Place School, and Girl Scout Troops 1573 and 1574 located in New Jersey. “There were 9 girls who participated in our hygiene classes. The girls were presented with their new kits on the last day. They were very excited to have received them. Our students are limited in their access to something like this. We are in a very impoverished area. These kits provide something tangible the girls can hold on to. It encourages them and excites them to look forward to a new beginning in their lives. They can mark this important milestone in their lives with answers and less confusion. They have these kits and know that people care. That they are not alone. They can use the heat pack and carrying case again and again as they need to. We had a great time with them. Thank you so much for helping these young girls in this way”. Thank you again for all of your support during the Indiegogo campaign. 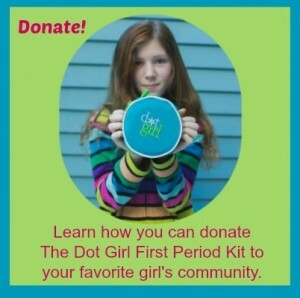 Please spread the word about the new Dot Girl campaign at The Crowd Funder Show so that we may continue to donate kits to girls who need them. This entry was posted in Dot Girl News, Events on May 13, 2014 by kathy. Dot Girl has officially designated today ‘Donate A Dollar’ Day! Why should you donate just a dollar to the Dot Girl campaign today? Activity on the campaign leads to greater visibility on Indiegogo. We are still on page 1 of the Education section however it would help greatly if the campaign moved to the top of the page. Just a $1 will do it! And you don’t even have to log in to Indiegogo to make the donation. It’s a quick, less than a minute transaction. Please help by spreading the word to your friends too. Send them the link and let’s see how many $1 donations happen! Thank you to all of our followers who are showing us some Twitter Love! This entry was posted in Dot Girl News, Events on April 9, 2014 by kathy. 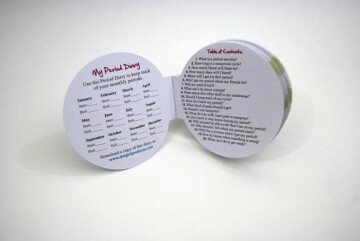 For a closer look at the contents of The Dot Girl First Period Kit I am showcasing two items today – The Dot Girl Period Answer Book and the Dot Girl Warm Pad. The Dot Girl Period Answer Book™ – a 20-page question and answer booklet covers the basics about menstruation including: How many days will it last? When will I get my first period? How do I track my period? What about cramps? What is a period anyway? Written in an easy-to-read and positive tone the booklet fits neatly inside the reusable case so girls can refer to it over and over again. My Period Diary is included on the inside cover of The Dot Girl Period Answer Book™. The Diary allows girls to track their period over the first year. The Dot Girl Warm Pad™ is a reusable gel heating pad for soothing cramps. If you have any questions about these two items please let me know. This entry was posted in Dot Girl News, Events on March 30, 2014 by kathy. Yesterday morning we were excited to receive a donation of $225.00 from a group of women who banded together to donate to the Dot Girl campaign. Each donor in the group contributed a small amount in the neighborhood of $10.00 and the power of the crowd raised enough for a significant contribution. The group has designated First Place School in Seattle to receive the Dot Girl Kits. 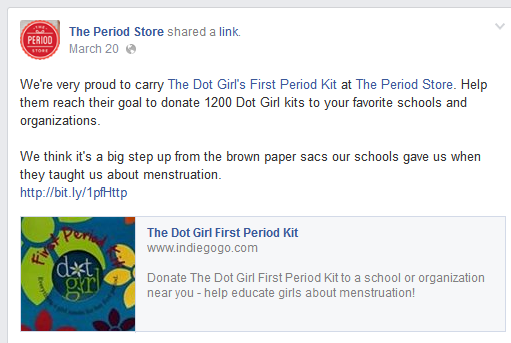 I’ve been asked about other ways that Dot Girl Products supports menstruation education. 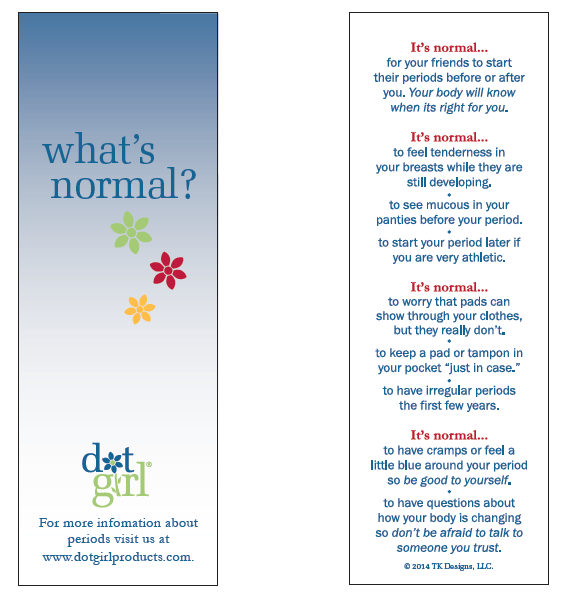 For several years now, Dot Girl has been donating free ‘What’s Normal?’ bookmarks to schools and non profit organizations. To date over 15,000 bookmarks have been donated to places such as Pacific Christian School in Santa Maria, CA; Thompson Health Hospital in New York State; and Gregory County Dept of Health in Burke, SD along with numerous Girl Scout Troops and public schools. If you are interested in receiving free bookmarks for your school or organization, please use our Contact Us page to send me your address, organization and number of bookmarks requested. This entry was posted in Dot Girl News, Events on March 28, 2014 by kathy. No donation is too small. In fact, we would love to be able to mail hundreds of Dot Girl bookmarks at the end of the campaign to all those willing to donate just $8! A $24.00 means you receive one Dot Girl kit at discounted pricing (with free shipping) and one deserving girl receives a free kit. Any donation is much appreciated. Thank you for your continued interest and support of our campaign! This entry was posted in Dot Girl News, Events on March 27, 2014 by kathy. 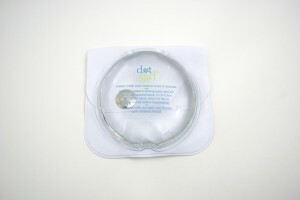 Dot Girl Indiegogo Campaign Launches! 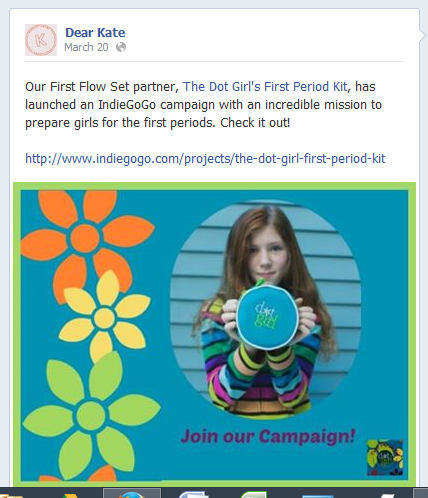 The founding mission of Dot Girl Products is to prepare every girl for her first period. The more girls know about the changes that will take place to their bodies during puberty, the more they will face this transition with confidence. Learning about their bodies in a supportive way will also help girls to take control about future health decisions they will face. We are a small company with big dreams and we want to help the many schools and organizations that ask for donated kits because of their own limited budgets. 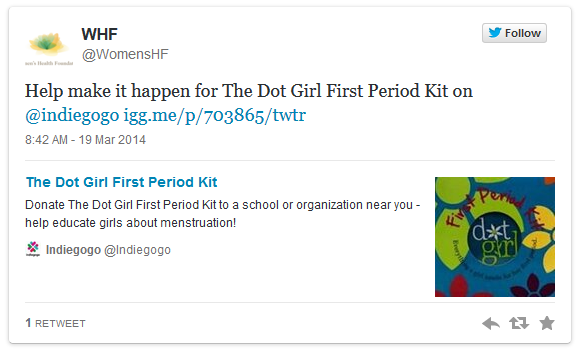 Believing that there is no time like the present to achieve our dream, we decided to turn to Indiegogo crowd funding to raise the necessary money to put The Dot Girl First Period Kit® into as many hands as possible. Our goal is to donate 1200 Dot Girl kits to deserving organizations. Through your generous donations more girls will have the tools and information needed to experience their first period prepared and confident. Together we will be able to support schools and organizations who are doing the important work of educating girls about periods. The campaign lasts from March 18th – April 27th, 2014. Learn how you or your organization can donate here. This entry was posted in Dot Girl News, Events on March 18, 2014 by kathy. 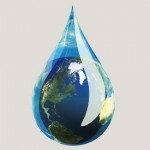 In the spirit of Earth Day 2013, I thought I would do some research and provide information on several charities that work to provide clean water for bathing, drinking and washing to people across the globe. This idea was sparked by my recent visit to the Gates Foundation Visitor’s Center in downtown Seattle. The exhibit includes a ‘water walkway’ where you can walk in the footsteps of an African woman who must walk several miles a day to get water for her family. There is even a bucket filled with water to give visitors an idea of how heavy the load is. Another subtext is the time spent on getting the water, time that could be spent on other activities such as growing food or educating her children. As a reminder, always use Charity Navigator to thoroughly vet a charity before sending them your money. I hope this list inspires you and your daughter to research these organizations and donate in support of working towards clean water for the populations who need it. Water Charity is a nonprofit corporation, directed toward improving the human rights and dignity of individuals throughout the world by providing them with resources that impact upon their health and wellbeing. With all donations applied to projects in the field, we have become one of the best and highest-ranked water charities delivering global services. 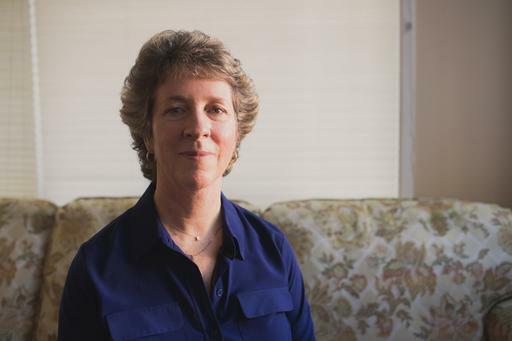 Clean Water Fund’s mission is to develop strong grassroots environmental leadership and to bring together diverse constituencies to work cooperatively for changes that improve their lives, focused on health, consumer, environmental and community problems. 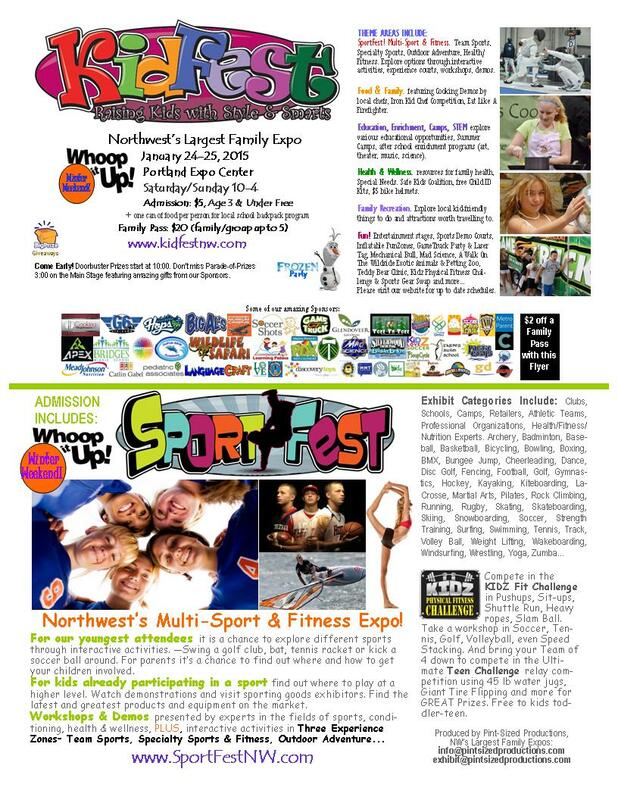 This entry was posted in Dot Girl Recommends, Events on April 22, 2013 by kathy.